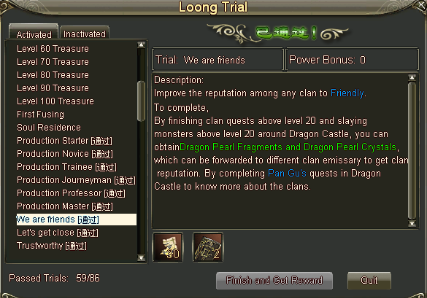 Loong Trials is a new reward system in 2.4, that rewards a wide range of things you do in game. This can vary from leveling to level 10, to hitting level 100 and a lot of other things in between. Generally most things in game have rewards. From gaining your first production skills, to leveling your pets & mounts and not forgetting rewards for completing Instances. 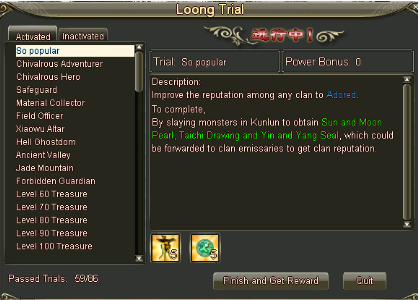 How do I get started with Loong Trials? To get started with Loong Trials, go to the far right of your screen to the Toolbar running down the right side or Press L on your keyboard. The inactivated tab is for Trials you haven’t yet unlocked. You will unlock new trials as you complete the ones you already have unlocked & by leveling.